Anzukko is one of the most famous gyoza places in Kyoto, along with Hohei and Chao Chao, but what separates Anzukko from the rest is not only how good their gyoza are, but how varied their menu is. At Anzukko, located close to the subway station Kyoto Shiyakusho-mae, you can choose from gyoza of every type, noodles, deep-fried chicken, sausages, Italian-style tofu, sundobu (Korean soup)… among others. But the main thing at Anzukko is their cast iron skillet fried gyozas and their excellent beer selection. They not only have three types of Minoo beer from Osaka for you to choose from, but they also have monthly craft beer specials that you can also try. This is the classic Anzukko-dish everyone should order when they’re at the gyoza bar. Note that you can only order eight if you’re alone and there’s a limit of 12 for two people. Note that all gyoza at Anzukko contain pork. With this gyoza soup, you have boiled gyoza in an earthenware pot, and a tasty soup made of milk and chicken stock. For 200 yen more, you get to add noodles to the soup after you’ve enjoyed the gyoza. If you know Japanese, the name tells you everything you need to know. And if not, I can tell you that one gyoza contains one whole shrimp, and for 450 yen you get two gyozas, also meaning two shrimp. The potato salad at Anzukko is one of their specialties, and the salad has just the right consistency, making it the perfect thing to use to refresh your palate a bit while eating gyoza. Remember to make a reservation before you go, especially if it’s Friday or Saturday! The restaurant is closed every year for a certain short period of time when the owner goes traveling, so make sure to check their website before going. Note that they have a cover charge of 280 yen per person, but you do get a small appetizer for it. They sometimes sell out of gyoza, so if you’re in Kyoto during the high season (cherry blossoms and autumn leaves) it’s better to go early so you can be sure you get to eat their delicious dumplings. 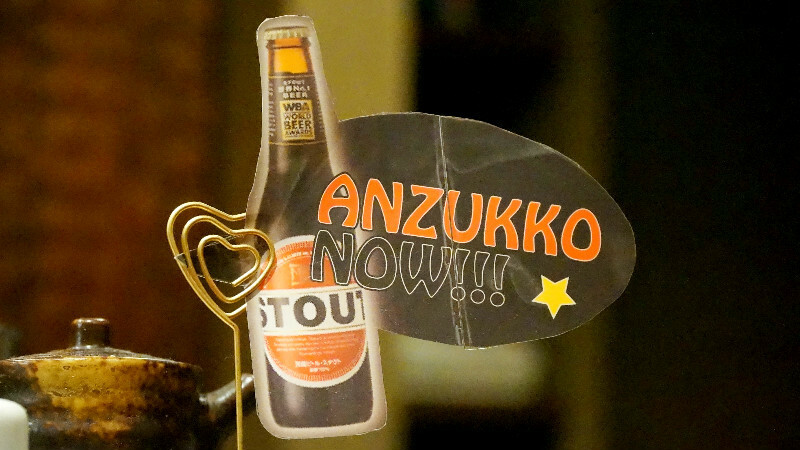 Anzukko is a restaurant/bar with a surprisingly varied menu, but their specialty is their gyoza. The little dumplings are so full of flavor that I actually preferred eating them as-is, without dipping them into Anzukko’s special dipping sauce, which itself was also pretty tasty. Anzukko is a short walk south from subway Kyoto Shiyashokusho-mae Station, but the restaurant is on the second floor so keep your eyes peeled when looking for it. Mondays, Thursdays and irregular holidays. Children under six years old are not allowed to Anzukko. As the restaurant is very small groups of over six people cannot be accommodated, and even with groups of six, you may have to sit on the counter apart from each other. Only Visa, for bills over 5,000 yen. The set menu is cash only. Their menu is in English, they can speak and understand English, and even their website is in English. What more could you want? The staff can speak English very well for a Japanese restaurant. Nonsmoking, but there is a smoking area outside the restaurant.